We all need a little inspiration sometimes and, for this project, I took my inspiration from the Impressionism style of paintings from the 1860s. 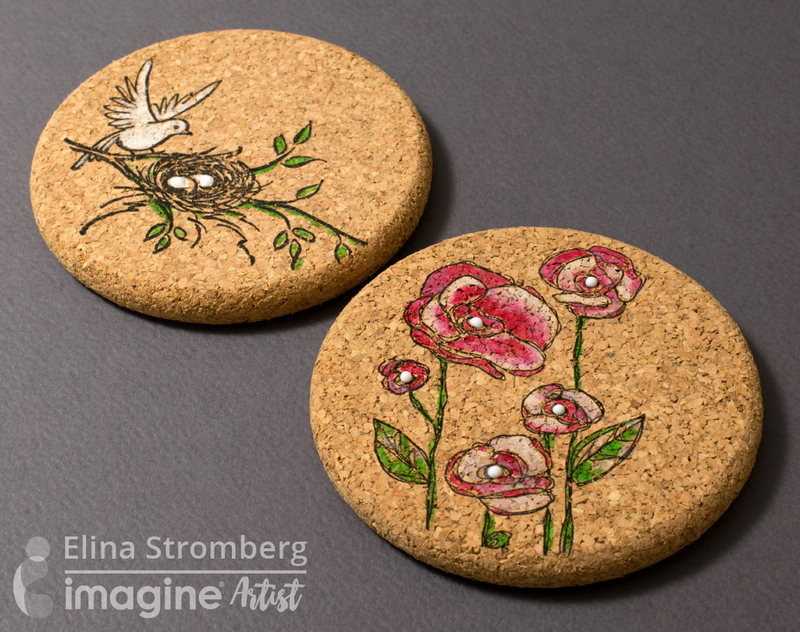 It resulted in a fun project using the All-Purpose inks and other Imagine products to create a miniature floral scene on a 4”x4” flat panel canvas. Apply Cool Grey ink to the canvas with a bullet-shaped Fantastix. Stipple on Sky Mist ink with Fantastix to the upper portion of the canvas. Stipple on Celadon ink to lower portion of canvas with Fantastix. Stipple Blue Bayou onto the upper portion of the canvas, sparingly. Place Celedon ink onto craft mat, ink stamp, & stamp stems onto the lower portion of the canvas. Stamp roses with VersaFine Clair in Medieval Blue & Monarch across canvas above the stems. Stamp saying with VersaFine Nocturne onto the canvas. Edge panel with Blue Bayou ink. Spray canvas with Sheer Shimmer Craft Spray in Sparkle. Edge canvas with Sheer Shimmer Stix in Gold. There are so many cute and fun stamps and dies on the market these days for the holidays that it’s truly tough to resist them. I don’t know about you but there’s only so much room in the budget and the stamp storage to go around, so I’m always happy to come up with ways to use the things I already have and getting more mileage out of my tools and supplies. To that end, these cards use patterned stamps that are not holiday-specific and simple shapes you can cut with basic dies, punches, or even just scissors. These simple shape cards are also perfect for crafting with kids in preparation for the holidays! Getting a head start on the holiday crafting rush, I decided to sew up a quick stocking and decorate the linen cuff with Fabrico markers, All-Purpose Ink, and some heat-embossed accents. While deciding just how I wanted to do the embossing I tried out a lot of products: VersaMark, Delicata, and Creative Medium to name the top three contenders, but I decided that the fine details that On Point Glue afforded made it the best choice for this project. Because of the heat embossing, you want to make sure that the area you’re decorating is a fabric that won’t melt when you hit it with the heat tool. Linen, cotton, canvas, or wool (the natural, sheepy stuff, not the polyester kind) should all work just fine, but you might want to test a small piece before getting too far into decorating your stocking. 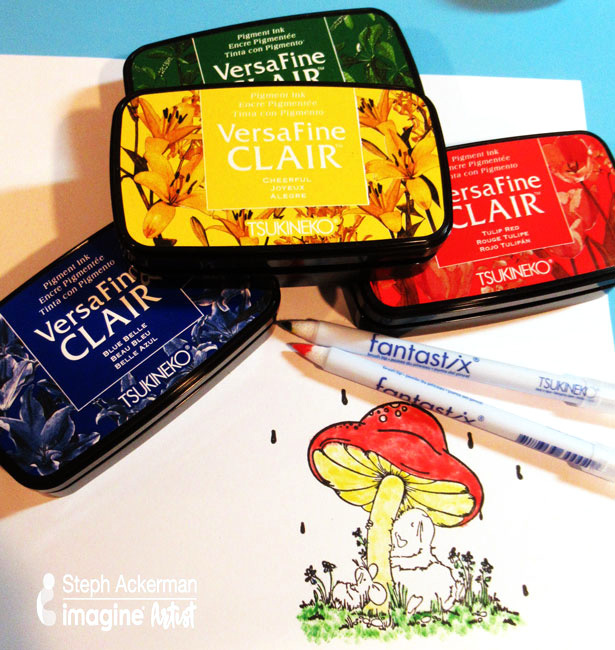 VersaFine Clair is great for using with wet mediums because it’s oil-based formula won’t interact with paints or sprays. But I also wondered what else I could do with this very versatile ink. 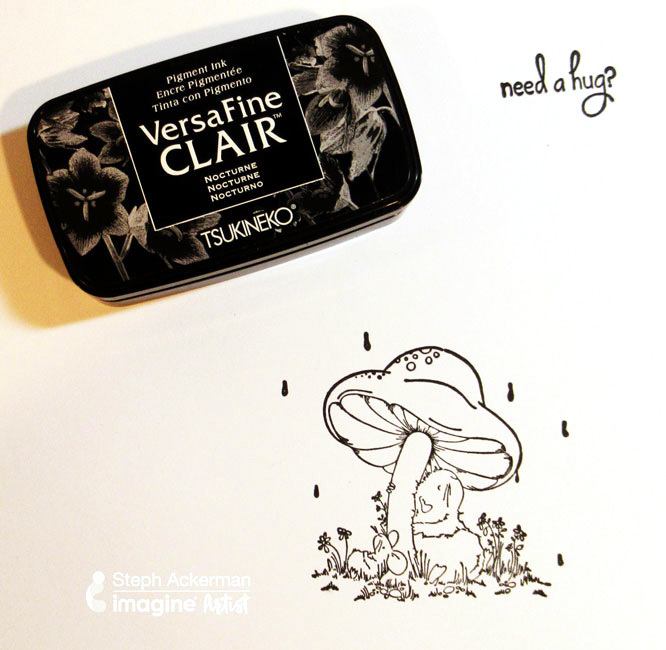 I discovered that VersaFine Clair’s quick-drying formulation makes for a wonderful, texture-rich dry brush effect when combined with Fantastix and that, while you can’t make a fluid medium with it and water-based thinners, a little bit of added oil will work! I had a lot of fun reaching beyond traditional techniques to create my “painted desert” scene. 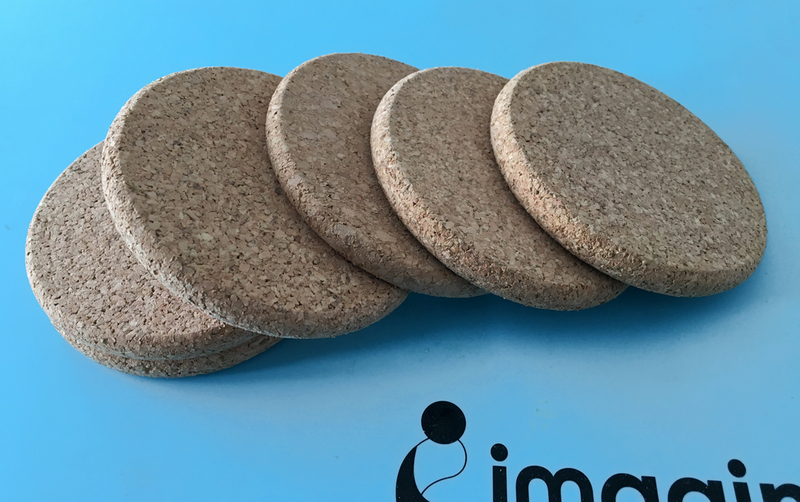 A while ago, I found a pile of old cork coasters in my kitchen cabinet. I had not used them in years and was just about to throw them away, but then I realized they were perfect for small home décor items. Maybe the beautiful material made me change my mind. 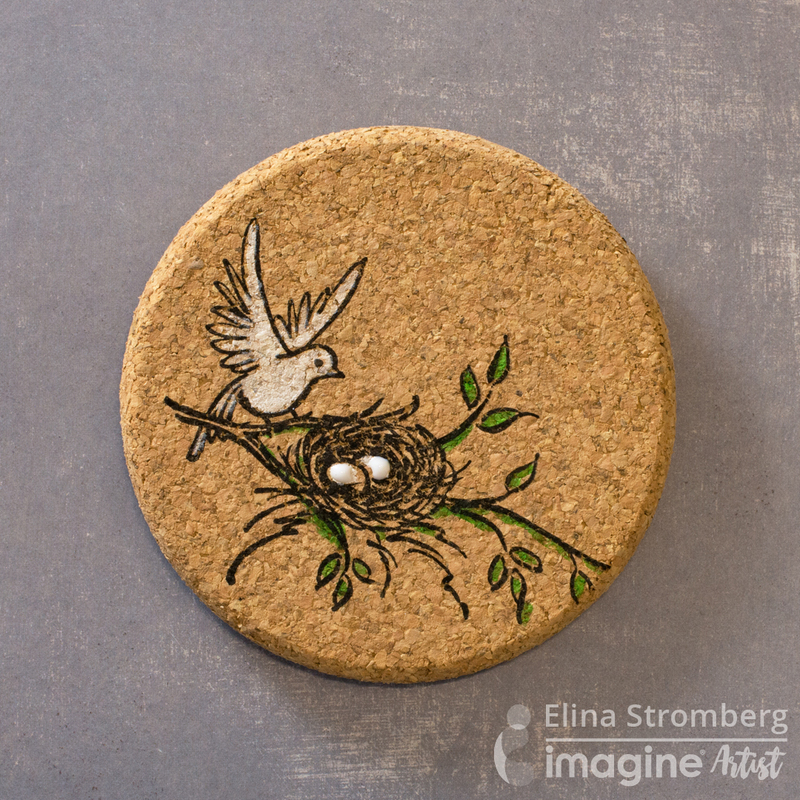 Nowadays cork is truly a trendy material in craft projects, so I thought I should try to turn the old coasters into something nice and new. And I’m so glad I did! Remove dust and stains from the coasters. Stamp the images using Onyx Black VersaFine. When stamping, press the stamp firmly on the cork surface. 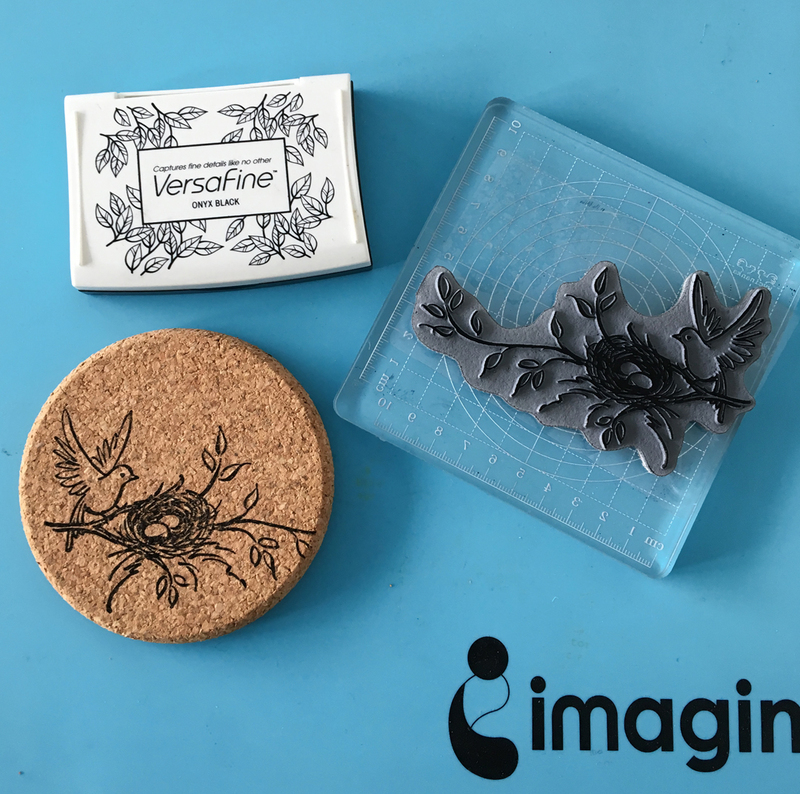 VersaFine is a great ink for solid image stamping and since it is a dense ink it should stamp on the cork well. Color images with All-Purpose Ink. Use irRESISTible Pico Embellisher in Wedding Dress (white) for decorating the stamped and colored images with dimensional paint dots. Let dry. Using a new Fantastix, color in the leaves with All-Purpose Ink in Spring Green. To finish this project, continue stamping and coloring the remaining coasters in your set. You have the option of making all 4 or 6 of your coasters different or repeating the same image for all. If you want to hang the decorated coaster on the wall, attach a loop on the back of the coaster with a strong adhesive. Have you ever made a mistake with coloring a stamped image and thought it was ruined? That you would have to start again from scratch? Well, this is what happened with this “Need A Hug?” handmade card. Stamp image and sentiment using VersaFine in Nocturne. 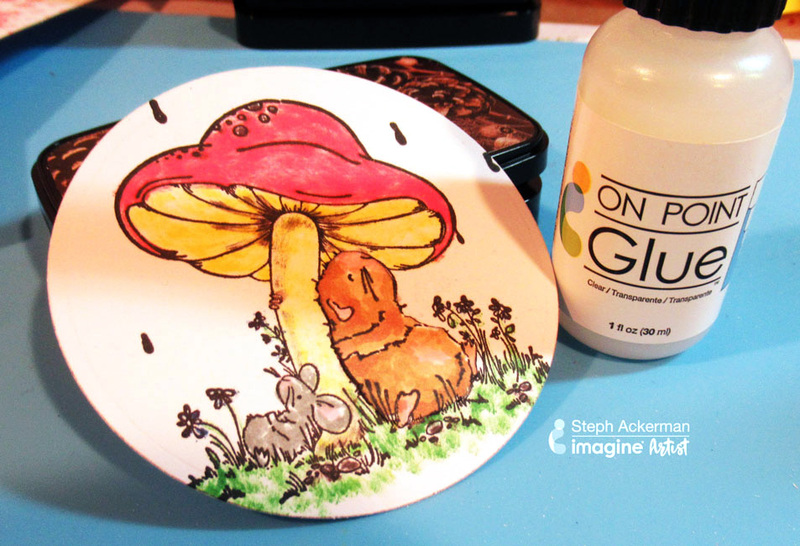 Using Fantastix, add color to the mushroom top using VersaFine Clair in Tulip Red. Add color to the rest of the image using VersaFine in Pinecone, Green Oasis, Blue Belle, Cheerful colors. Color the small mouse with Memento Markers in London Fog and Angel Pink. 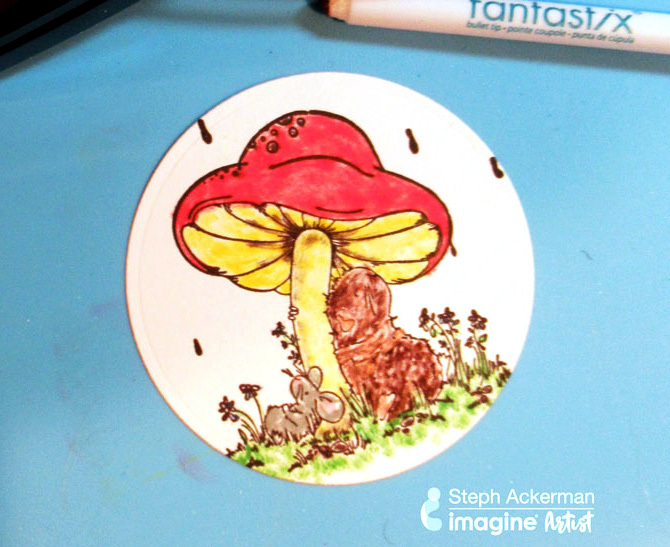 I used Fantastix to color the large mouse with VersaFine Clair Pinecone ink. It’s here that I noticed the image to be problematic. To me, the large mouse was just too dark, and yet the mushroom was perfect just the way it was. To salvage the mushroom image, I decided to re-stamp the large mouse on a scrap of cardstock. I colored the “new” mouse with Memento Markers in Desert Sand and Angel Pink. Then I fussy cut the mouse and placed on top of the main image using On Point Glue. The focal image is now salvaged. No one will know a mistake was made! This can apply to any cardmaking or stamping project you take on. Now let’s move on to the rest of the card design. 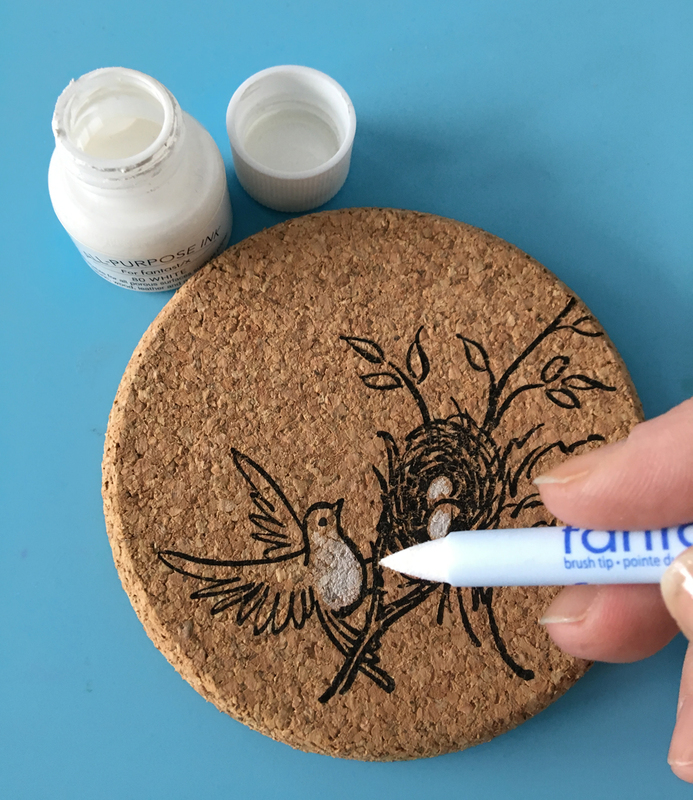 Use a medium size circle die to die cut the perfected image. 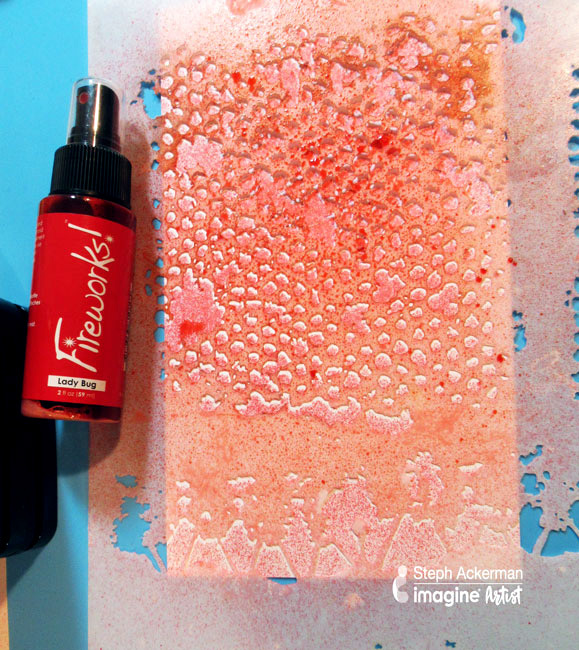 Using Fireworks Shimmery Craft Spray in Lady Bug, spritz through a stencil creating a unique background. Cut the stenciled panel to fit the card base. 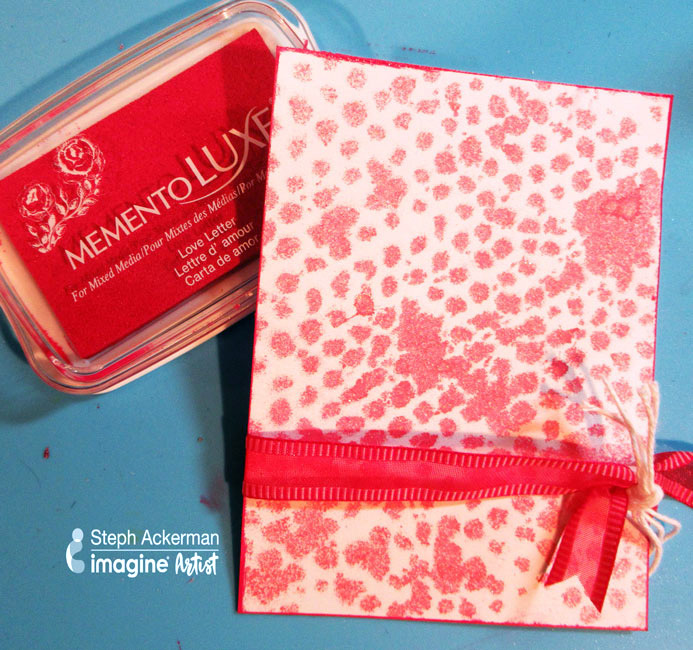 Ink edges with Memento Luxe in Love Letter. Wrap with similar color ribbon and twine. Adhere stenciled panel to card. 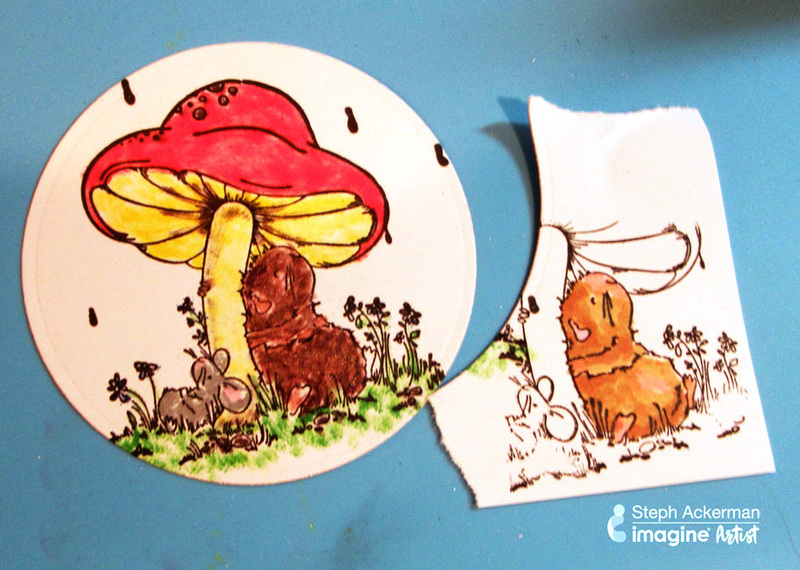 Die cut a slightly larger circle to act as a base to mount the stamped mushroom image. Ink edges of mushroom image and “need a hug?” phrase with Delicata in Rose Gold. Mat each with the larger circle cardstock mats. 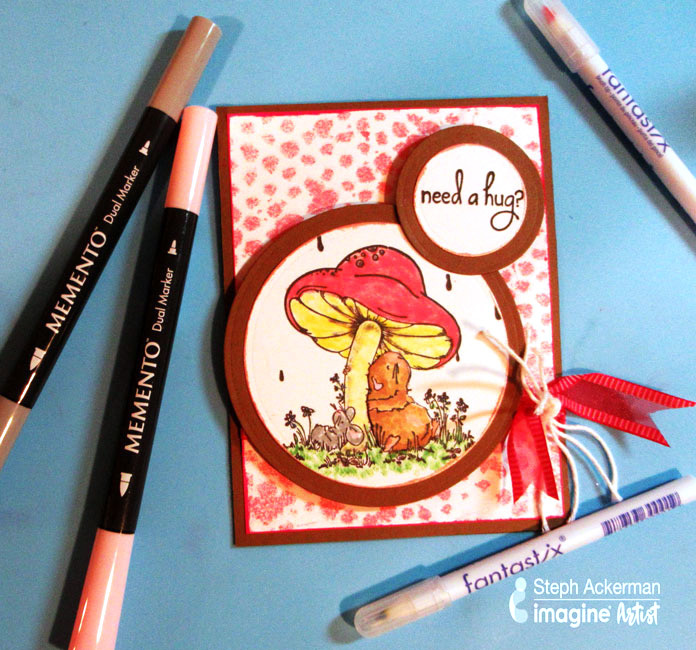 First, add the mushroom image to card with foam adhesives. Add the sentiment to the top of the card slightly overlapping stamped image. Finish with any additional personal styling to make it your own.